“Hazeltine draws on a list of influences which are a key to his style, and to an interesting take on modern jazz piano: Oscar Peterson, Cedar Walton, Buddy Montgomery and Barry Harris. - Richard Cook & Brian Morton, The Penguin Guide to Jazz, 6th Edition. 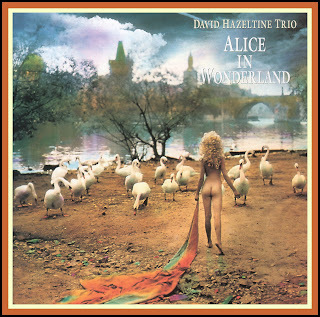 The piano, bass and drums trio is a form of Jazz expression that has been constantly pleasing to me over the years and among its current practitioners, I find myself returning again and again to the music of David Hazeltine. 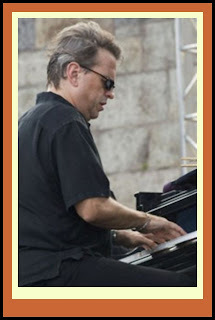 David Hazeltine is a pianist, composer, arranger whose creative talent has received well-deserved praise from the Jazz press in recent years. He has been the subject of a recent article in down beat magazine as penned by the distinguished Ira Gitler and there are also two, comprehensive treatments about him and his work on the All About Jazz website, one by John Dworkin and the other by Bruce Crowther which is available below and which forms the conclusion of Part 1 of this feature. In addition to his trio work, Mr. Hazeltine plays in the groups led by trumpeter Jon Faddis and alto sax and flute player James Moody, and he is the artistic/musical director for vocalist Marlena Shaw and the collective One for All. The JazzProfiles editorial staff became familiar with Mr. Hazeltine’s playing primarily through three different, yet convergent, sources:  his own piano, bass & drums trio albums, his work as the pianist and one of the composer-arranger for the sextet known as One for All, and  his appearance as a pianist on the albums by each of the principal horn players who make up One for All – trumpeter Jim Rotondi, trombonist Steve Davis, and tenor saxophonist, Eric Alexander. For a group of musicians who individually and collectively have been on the current Jazz scene for less than 15 years, they have issued an astonishingly large number of excellent recordings, many of which will be reviewed and discussed in Part 2 of this feature. This “abondanza” not only speaks to the quality of their musicianship but also to the artistic and entrepreneurial foresight of Gerry Teekens at Criss Cross, Marc Edelman at Sharp Nine and Tetsuo Hara and Todd Barkan at Venus Records, the owners of the three labels that have taken a principal interest in recording them. 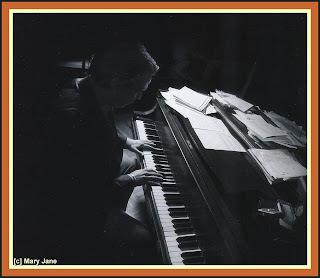 In an effort to do justice to the full spectrum of his work, the first portion of this JazzProfiles feature on Mr. Hazeltine will focus on his trio recordings while Part 2 will highlight his work on recordings by One for All and his playing as a pianist on the albums by each of the principal horn players who make up One for All such as trumpeter Jim Rotondi, trombonist Steve Davis and tenor saxophonist Eric Alexander. Mr. Hazeltine has issued over 25 album under his own name and most are gems of piano trio Jazz that offer stylistically interesting arrangements and inventive, emotionally engaging soloing.Another element of Mr. Hazeltine’s approach to Jazz that I find favor with is that he leaves plenty of room for his drummer-of choice, be he [usually] Joe Farnsworth or Billy Drummond or Louis Hayes, to stretch-out, which they all do in a melodically interesting way that is very reminiscent of Max Roach, one of the very few drummers whose musical solos were appreciated by nearly all listeners. 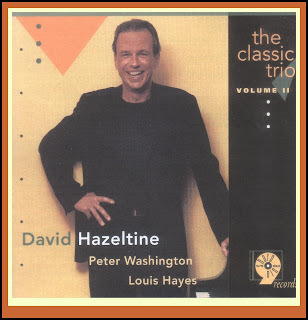 With his trio, Mr. Hazeltine has made theme albums that focus on the music of a single composer as well as albums that offer a more diverse repertoire made up of standards from the Great American Songbook, more recent composers such as Jimmy Webb and Stevie Wonder and his original compositions.As an example of the theme albums that focus on the music of a single composer, Mr. Hazeltine selected compositions by Burt Bacharach, and Bud Powell for two of his more recent recordings on Venus. A third issued earlier in 2003 was made up of compositions generally associated with, but not written by, the late Bill Evans. Insuring that each tune is interestingly arranged, always trying to “say something” in his solos and sharing some degree of participation from his bassist and drummer in the expressive effort, these aspects of Mr. Hazeltine’s approach to trio Jazz are all throwbacks to trios headed up by the likes of Nat King Cole, Hampton Hawes, Oscar Peterson, Claude Williamson, Ahmad Jamal, Eddie Higgins, Red Garland, Vince Guaraldi, Victor Feldman, Hank Jones, Tommy Flanagan, Sonny Clark, Jimmy Rowles, Clare Fischer and, in more recent times, Keith Jarrett, Bill Evans, Alan Broadbent, and Michel Petrucciani, to list but a few. 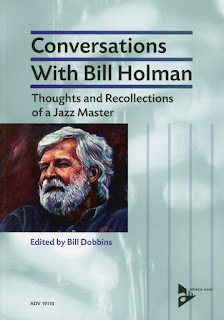 What Mr. Hazeltine’s stresses in his approach goes to the essence of Jazz in that once a thematic topic has been engaged, it allows for a collective “conversation” involving his trio’s participants. His idea of making Jazz is all about thoughtful and artfully presented music. There’s no technical grandstanding here, no flying fingers for the sake of flying fingers, but rather, a speculative inquiry along the lines of: how can I substitute interesting, alternative melodies and/or harmonies [appropriate chord substitutions] and fashion a different story to tell? This is no easy task considering the size of the footprint left on piano trio Jazz by many of its principal exponents over the years, not the least of which are those included in the previous groupings above. How does a pianist take this tradition forward – by breaking the mould or by adding another layer to it?Here’s one way Mr. Hazeltine resolves this dilemma. Rather than attempt another fast and furious version of Bud Powell’s burner Tempus Fugit, he adapts it as a medium tempo cooker and, in so doing, clearly enunciates it’s melody as few before have ever done [including it’s originator]. He plays it through and improvises upon its AABA structure with a clarity that gives the original composition a pellucid quality rarely ever heard before. If you have ever wonder what this tune really sounded like while others have huffed-‘n-puffed their way through it in an effort to emulate Bud’s version, you are in for a treat when you hear Mr. Hazeltine’s interpretation of it. And it doesn’t stop here, Wail which is usually played at tempos with an intent to snap off the metronome needle is also taken as a moderato as are Glass Enclosure and Dance of the Infidels, thus allowing the listener to get re-acquainted with their original melodies and their improvisational possibilities. What we have here is not just a case of someone trying to be different for the sake of being different, but rather, a musician who is deeply interested in finding his own possibilities with Bud’s vehicles. 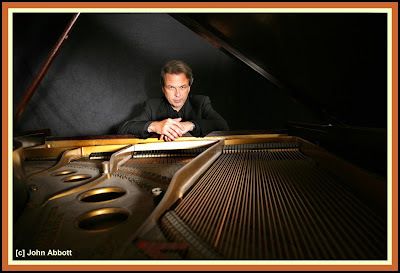 The question becomes not one of emulating Bud Powell – a sheer impossibility – but of discovering David Hazeltine through the compositions of Bud Powell – a possible, artistic realization. 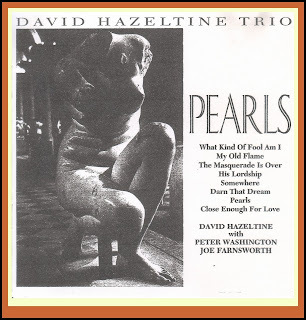 Mr. Hazeltine's homage to Bud Powell can be found on the Venus Records disc entitled Cleopatra's Dream [TKVC 35213]. 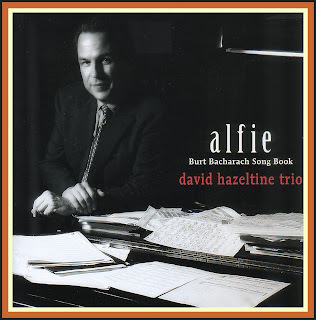 Another of Mr. Hazeltine’s recordings that concentrates exclusively on the works of one composer is Alfie: Burt Bacharach Song Book [Venus TKCV- 35375]. Besides delving into a songbook by a composer whose work is not usually associated with Jazz, here again uniqueness is a mainstay in the way Mr. Hazeltine configures each tune for interpretation and improvisation. The result is that he successfully brings Burt Bacharach’s music into the Jazz World and out of the commercial music triteness in which many of the composer’s tunes customarily reside. 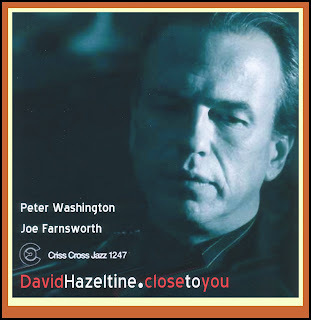 On this CD, Mr. Hazeltine is ably assisted by bassist David Williams and drummer Joe Farnsworth as he refashions the title tune along with other familiar Bacharach themes into entertaining and interesting Jazz. He seems to have a knack for taking what are apparently commonplace and pedestrian melodies and bringing them to life as interesting compositions. Whether its In Between the Heartaches played as an up-tempo bossa nova, or Close to You, rendered as a 6/8 Latin tune with the refrain played in a fast 4/4 that is wrapped around a bossa nova bridge, or This Guy’s in Love With Me played in a jaunty 2/4 before the soloing takes over in a snappy 4/4, and wait until you hear What the World Needs Now Is Love done in a finger popping, slow blues style. The listener comes away from Mr. Hazeltine’s interpretations with an awareness of these and other new possibilities in Burt Bacharach’s music. It’s no longer schlock, but a assemblage of melodies that now warrants entry into the Great American Songbook. One of Mr. Hazeltine’s greatest gift is his ability to reinterpret the music of others so as to give it either a different and legitimate entry into the Jazz World, especially by making the music swing. He sees and hears other possibilities and brings the gift of freshness and imagination to his listeners. 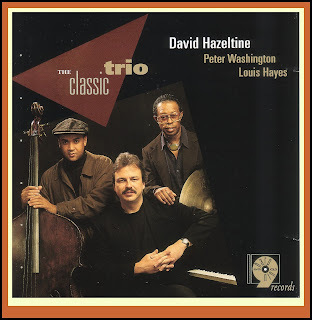 And yet, in keeping with the tradition of other great Jazz trios, Mr. Hazeltine accords tremendous attention to detail in the arrangements that he brings to each tune. They are colored with interludes, vamps and other rhythmic phrases, new ways of segueing into the melody or closing out of it, and there are even thematic structures that are comparable to shout choruses before he takes certain tunes out. And then there are the engaging improvisations; that draw the listener in and reveal different ways of putting notes together, phrases that sound familiar but really are unique, in spite of the stylistic similarities with Barry Harris and Cedar Walton. There’s nothing earth-shaking here, but Mr. Hazeltine swings like mad and as Jon Faddis emphasized in one of the opening quotations to this piece, “… he doesn’t over complicate things." His music is so accessible and enjoyable that in addition to Barry Harris and Cedar Walton, the easy and effortless styles of Hank Jones and Tommy Flanagan come to mind when listening to Mr. Hazeltine. Interestingly, as is the case on Alice in Wonderland [Venus TKCV 35327] he can take a collection of standards often association with Bill Evans, a pianist whose work is sometimes considered obtuse if not abstruse by some listeners, and make them utterly approachable and satisfying. Without attempting to sound demeaning of Bill Evans in any way, it’s almost as though Mr. Hazeltine has taken Bill’s lush voicings and taken them back through Barry Harris, Cedar Walton, Hank Jones and Tommy Flanagan, to subtract their essence and make them a bit less complicated and dense on the ear. While listening to the Mr. Hazeltine’s attempts at long, continuous "lines" [improvisations on Autumn Leaves [which has an excellent extended drum solo by Billy Drummond] and on How Deep is the Ocean, one is reminded to of pianist Lennie Tristano, who often aimed at lengthy, unbroken creations in his solos. 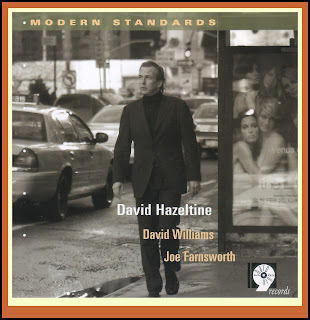 As the title of his disc Modern Standards [Sharp Nine Records CD 1032-2] would imply, Mr. Hazeltine broadens his interpretations of standards to include not only the more recent contributors to the Great American Song book such as Henry Mancini [Moment to Moment], Johnny Mandel [A Time for Love], Leonard Bernstein [Somewhere] and more of Burt Bacharach [A House is Not a Home], but to also reach out to arrange and improvise on tunes by The Beetles [Yesterday] and The Bee Gees [How Deep is Your Love]. The CD also includes Mr. Hazeltine’s very hip interpretation of Sy Coleman’s Witchcraft. Joining him on this recording and playing and integral and integrated part in its music are David Williams on bass and Joe Farnsworth on drums. “[In the case of Mancini, Mandel, Bernstein and Bacharach] beautiful melodies and traditional harmonies. When I say traditional, I mean in the same kind of ballpark as, say, Cole Porter, in the overall view of his tunes. 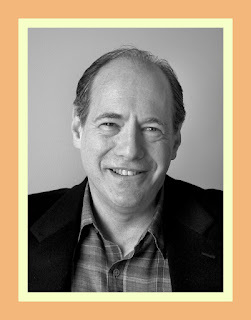 But then they do some very interesting things that take them out of that realm and make them a little more modern than Cole Porter of George Gershwin. What they are doing come out in such a way that it’s just open enough that I can mess with it. There’s space for me to get something else out of it.. Although Mr. Hazeltine’s 2005 recording for Sharp Nine had progressed to the point of having the word “modern” in the title, the first two CDs that he earlier put out for the label had the word “classic” in the title, no doubt in deference to the time-honored piano, bass and drums Jazz trio format. The first of these is simply entitled The Classic Trio [Sharp Nine 1005-2] finds Mr. Hazeltine in the company of bassist Pete Washington, who has become the first call Jazz bassist in New York since these recordings were made and Louis Hayes whose pedigree in the music dates back to the late 1950’s quintet’s led by Horace Silver and Julian “Cannonball” Adderley, respectively. In addition to his tunes, Mr. Hazeltine’s first trio foray on Sharp Nine also includes an interesting bossa nova version of Bill Carey and Carl Fischer’s You’ve Changed which really succeeds well in lifting if from its typical “torch song” renderings, and extremely well-executed version of Bud Powell’s The Fruit and unique version of Sweet and Lovely with the moodiness of its melody enhanced by being played in a 6/8 time triplet feeling. In his Classic Trio II sequel, Mr. Hazeltine’s novel compositions are once again on display. including For Pete’s Sake, an original once again dedicated to bassist Washington but this time in the form of a twelve bar blues on which the line [melody] is played in unison by the bassist and Mr. Hazeltine’s left-hand rumbling around in the lower register of the piano. This is followed by What A Difference a Day Makes played in a rarely heard up-tempo version. Along the way are beautifully conceived arrangements of Duke’s Prelude to A Kiss, Mancini’s Days of Wine and Roses, and a cleverly conceived arrangement of Bewitched, Bothered and Bewildered. “The trio is a uniquely significant ensemble form. For reasons aesthetic and economic, the trinity of piano, bass, and drums has evolved into the irreducible unit for jazz performance. Only the solo piano - in the hands of virtuosos, principally Art Tatum, who have mastered the instrument's orchestral possibilities - can rival the trio's status as the smallest prime number for complete artistic expression in America's classical music. While this socially constructed arrangement may be legitimately challenged in pursuit of new limits, it is far from exhausted. The Oscar Peterson Trio set enduring standards by which trios have been defined and measured. Ironically, what began as an unplanned but acclaimed duo performance featuring a new Canadian pianist and renowned bassist Ray Brown at Carnegie Hall for Norman Granz' Jazz At The Philharmonic OATP) in 1949, led to an unprecedented collaboration (1951-1966) that established the dominance of the trio as a popular form. Moreover, the transition to the jazz trio's prevailing instrumentation was sealed when the guitarist Herb Ellis (1953-58) was replaced by the drummer Ed Thigpen (1959-1965). In this respect, the Oscar Peterson Trio was the bridge between the customary piano/bass/guitar configuration of the Art Tatum and Nat "King" Cole Trios and the more percussive arrangement that led inevitably from the contributions of Kenny Clarke. This last point cannot be emphasized enough for whatever the thematic source, or the nature of the arrangement or the tempo of the tune – Mr. Hazeltine swings. 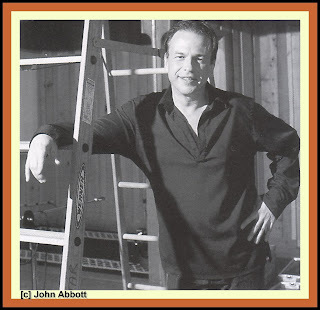 This portion of the feature on him concludes with an interview with Mr. Hazeltine about his background in music in general and Jazz in particular that was conducted by Bruce Crowther and published as Making it Mean Something www.allaboutjazz.com October 16, 2003. 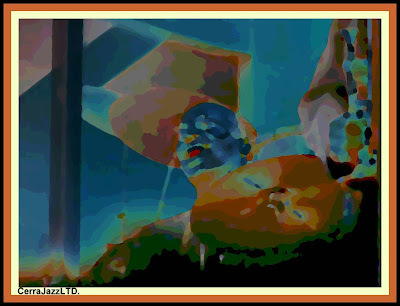 It is another fascinating example of how, by pluck and luck, someone finds their way into the marvelous World of Jazz. - [C] Copyright protected; all rights reserved. 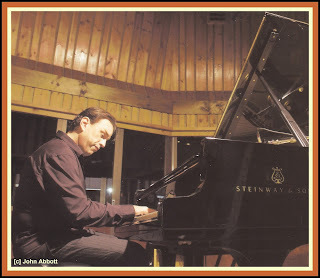 One of the outstanding jazz piano players in the world today, David Hazeltine grew up in Milwaukee, Wisconsin, where he was born 27 October 1958. 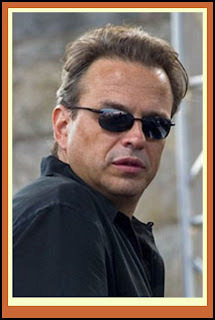 Early in 2003, shortly before embarking upon a European tour with Jon Faddis, David took time to set down some comments on his career to date, and to where the future might lie for him. He also had much to say about the artists who have helped shape his musical thought and the life he leads in jazz. He did not at first plan on a career in music. Through high school and later on in college, his eyes and mind were set on a career in electrical engineering, but beneath the surface other influences were at work. As a young child he had heard jazz through an older brother who was a fan, but it was not until his mother bought him a Jimmy Smith album that he began to take a serious interest in music, and in particular the organ. When he was around fifteen, he switched to piano and during his high school and college days worked a lot of gigs and continued his practicing and his classical music studies. David's switch from organ was prompted by the wide range of possibilities on the piano. Thanks in part to his early start, but mainly due to his clearly apparent ability, at the age of twenty-one he became house pianist at in Milwaukee's Jazz Gallery. 'It was there that got a chance to play with Sonny Stitt, Pepper Adams, Chet Baker, Charles McPherson, Al Cohn, Lou Donaldson, Eddie Harris, a lot of great musicians who were at that time touring as singles with house rhythm sections. At first playing with these people it was just plain scary and intimidating but eventually I was able to relax and enjoy and absorb everything they were doing - or a lot of things that they were doing. In 1981, encouraged by Chet Baker, David moved to New York City, so that he could be around those touring musicians with whom he had played as they swung through Milwaukee. Two years later, domestic considerations prompted a return to his home town but by 1992 he was eager to be back in New York. 'By this time I wanted to be a major player in the New York and international scenes. I was frustrated in Milwaukee, and I felt that I owed it to myself to participate in the real world and not waste my talent in a place like Milwaukee. I'd invested too much of myself in jazz to do that, so what's why ultimately I came back to New York and I've stayed ever since. 'At first, I had a little gig at the Star Cafe at 23rd and Seventh, it's not there anymore, in fact they gutted the whole building, but at the time I was playing a lot with Junior Cook there. Also, I played with Curtis Fuller, and for a time I was on the road with Jon Hendricks. 'More recently, I have played with One For All. Besides playing collectively, I have a special individual relationship with each guy in the band. We've played a lot together; and we've all played and recorded a lot with each other. Eric Alexander and I have recorded and worked together many times, as have Steve Davis, Jim Rotondi, Joe Locke and I. Also, I have a funk band with Jim and we play at Smoke every Thursday when we're in town. From the early years of his career, David has had a deep interest in and an intense commitment to the advancement of jazz culture and awareness. This has been manifested by his involvement in education. In Milwaukee, he was co-founder and direct or of The Jazz School, and the Program Coordinator of Jazz Studies, and later Department Chairman at the Wisconsin Conservatory of Music in Milwaukee. For a time, he was also an Associate Professor at Berklee College of Music. Latterly, he teaches privately in his own studio. Among many profound influences on David have been saxophonists, notably Charlie Parker, John Coltrane, Joe Henderson, Sonny Rollins, Cannonball Adderley and Eddie Harris. 'Melody is very important to me and I like saxophone players more than piano players. Definitely. I prefer to listen to horns. Playing the piano is what I've done and obviously there are many things I like about it, but I really like the freedom of a horn. I like the things that they can do melodically and expressively, almost like a voice, that a piano just can't possibly do. They have profound melodic rhythmic shapings to their lines. Guys like Parker and Coltrane and Rollins are my main influences. I've sat down and studied and learned to p lay, to improvise in their styles. They are, I think the most original. You know, after Charlie Parker it becomes a matter of who is most original in his approach to what he laid down. Because everybody plays more or less the voicings of Charlie Parker. I t's just a matter of what's been done with it as far as I'm concerned. 'The pianists who have influenced me the most are Art Tatum, Barry Harris, Bill Evans, McCoy Tyner, Herbie Hancock, Cedar Walton, Buddy Montgomery. They are the top guys for me. This commitment, in particular to the great tradition of jazz piano playing, results in David's audience hearing an artist whose playing is not only highly sophisticated, but is also highly accessible. Among the results of this musical policy have been a growing body of critical acclaim and an ever-expanding audience for his work, whether live or on record. It is not hard to understand why. Immediately apparent is the fact that, never, at any time, does he lose his great attachment to the melodic core of his artistry. Equally important, is David's consummate skills as a performer, skills that are underpinned by an unfailing sense of the needs of the music, an ability to swing at all times, a questing musical intelligence, and the enormous technical ability to bring off his ideas with understated flair and great aplomb. Anyone who worries over the future of jazz need only listen to this immensely talented musician to know that this future is in safe hands. [C] - Steven A. Cerra, copyright protected; all rights reserved. 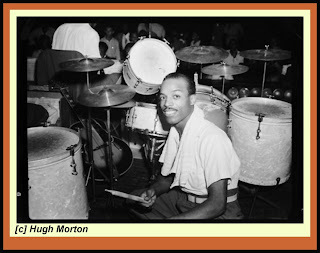 Thanks to a fortuitous meeting on July 4, 1957, I didn’t make the mistake of overlooking Papa Jo Jones when I reached out for my formative influences as an aspiring, young Jazz drummer. 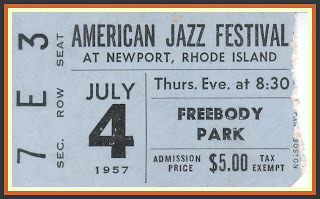 The setting for this happenstance was the 1957 Newport Jazz Festival which, after much cajoling, I finally got my Dad to agree to take me to [we lived in Providence, RI]. We were able to stay for all four days of the event as my Aunt [my Dad’s sister] owned a home nearby. 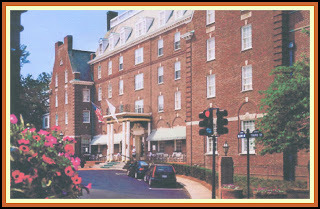 In those early days of its existence, the event was called the “American Jazz Festival at Newport, Rhode Island” and the gathering place for most of the musicians and dignitaries participating in the festival was Newport’s Hotel Viking. The man calling out this inviting salutation had a broad smile that seemed to engulf his entire face. His eyes appeared to be gleaming with the joy of life and his manner of dress was, in the parlance of the time, swanky. From that moment on, the drumming of Papa Jo Jones entered my life and it has never left; forever imparted in my psyche. For as Dr. Bruce Klauber has so aptly stated. 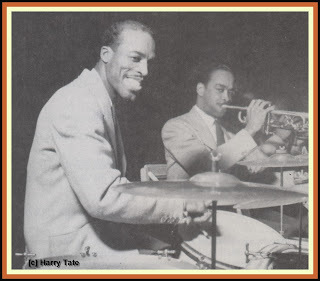 At the time of my introduction to him, I didn’t realize that Jo Jones was no longer the regular drummer with Basie’s Band and hadn’t been since leaving the Count in 1948. 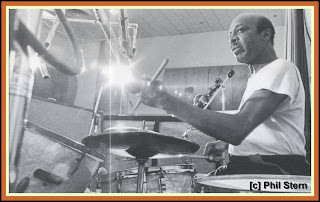 In the late 1950s, the drummer with the Basie Band was Sonny Payne. He played on all of the wonderful charts that composer-arranger Neal Hefti was then writing for the band, including providing the marvelous brushwork on “Cute,” which became one of his drum features. Sonny was also on the Basie Band the night I heard them, but he gave way to Jo Jones and several other illustrious alumni of the band during a portion of the Sunday, July 7th concert at Newport, including Lester Young [whom I later found out was nicknamed ‘The Pres,’ short for The President of the Tenor Saxophone’]. Some of the recordings from the era when Jo played with the band were beginning to be released on LP and this provided me with more opportunities to listen to him closely. At this early age, Buddy Rich and Joe Morello had techniques that were unattainable by most, mere mortals [they still are] and Gene Krupa was too much of a showman for a quick-to-be-embarrassed teenager. But Jo Jones’ style of drumming was something that I could get on with during the copying and emulating periods in my development as a drummer, because Jo kept it all so simple. The year following my meeting with Jo at the Newport Jazz Festival, my parents moved to Southern California. 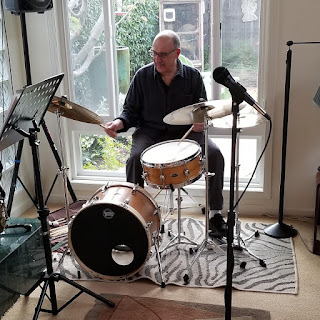 Soon thereafter, I met Victor Feldman who had eschewed playing drums and was instead playing piano and vibes as a member of Howard Rumsey’s All-Stars at the Lighthouse Café in Hermosa Beach, CA. Perhaps he took pity on me or needed the money, or both, but Victor agreed to offer me drum lessons. [One of the little known facts about Victor was that as a drummer, he was the equal of Rich and Morello]. 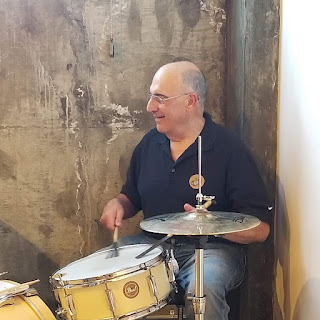 During one of our first instructions in a practice room at Roy Harte’s Drum City in Hollywood, CA, he suggested that I play time around the instrument using brushes on the snare, sticks on the ride cymbal and then sticks on the hi-hat while he observed. Here’s more about Jo Jones as expressed in this brilliant short essay by the peerless Whitney Balliett from his Dinosaurs in the Morning. [Philadelphia: J.B. Lippincott, 1962, pp 61-67]. © Copyright protected; all rights reserved. 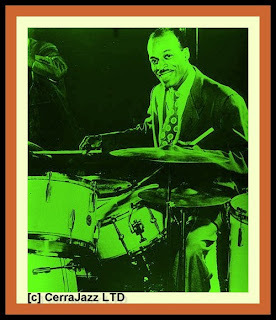 “ONE of the minor legends of jazz, which has a mythology as busy as the Greeks', credits Jo Jones, the forty-eight-year-old Chicago-born drummer, with single-handedly setting off, in the late thirties, the revolution in drumming since blown forward by Kenny Clarke, Max Roach, Art Blakey, Philly Joe Jones, and Elvin Jones. This theory holds that Jo Jones was the first drummer to use his bass drum for accents as well as for a timekeeper, the first to shift his other accompanying effects to his cymbals, and, all in all, the first to develop a whistling-in-the-morning attack that made most previous drumming resemble coal rattling down a chute. Nonetheless, several contemporary drummers were doing many of the same things, and not necessarily because they knew Jones's work. (A highly regarded legendizing process in jazz is the convenient device of linking musicians with similar styles. Thus, John Lewis was once firmly informed that he resembled the late Clyde Hart, an economical and original pianist who was an indirect founder of bebop. Lewis replied that be had never heard Hart, in the flesh or on records.) 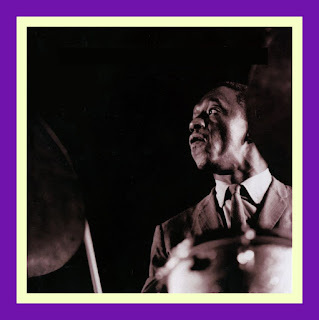 Among these drummers were Chick Webb, whose work on the high-hat and the brushes is among the permanent ornaments of jazz; Alvin Burroughs, an adept, clean, nervous performer, who played as if on springs; O'Neil Spencer, who had much in common with Burroughs; Sidney Catlett, whose cymbal patterns, singular snare accents, and free-floating foot pedal were neater and snappier than Jones's; and Dave Tough, who often implied even more than Jones and whose cymbals, in particular, had a splashing clarity. But any disagreement with the theory about Jones's supposed pioneering is leveled not at him but at his admirers, who, like all jazz appreciators, are full of imagination. 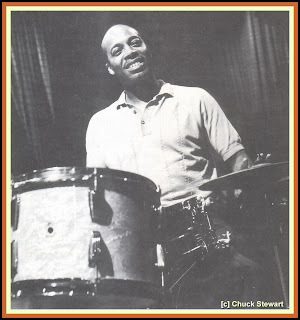 One of the handful of irreplaceable drummers, he stands -since Webb, Catlett, Burroughs, Spencer, and Tough are dead and most of the rest of his contemporaries are either inferior or in decline - as the last of a great breed. 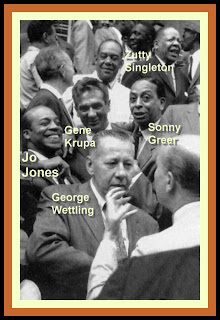 One reason for Jones's over-glorification as a pioneer was his membership, from 1936 to 1948, in the Count Basie rhythm section, which included - in addition to Basie and Jones - Freddie Greene and Walter Page. 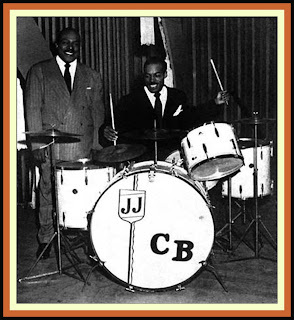 This Basie rhythm section was classic proof of the powers of implication, for it achieved its ball-bearing motion through an almost Oriental casualness and indirection, as if the last thing in the world it wanted was to supply rhythm for a jazz band. The result was a deceptive sailing-through-life quality that was, like most magic, the product of hard work and a multi-layered complexity that offered the listener two delightful possibilities: the joint less sound of the unit as a whole, or, if one cared to move in for a close-up, the always audible timbre of each of its components. And what marvelously varied timbres they were! At the top was Basie's piano, which, though most often celebrated for its raindrop qualities, attained its relaxed drive from a skillful pitting of loose right-hand figures against heavy left-hand chords. On the next rung came Greene, a peerless rhythm guitarist, whose Prussian beat, guidepost chords, and Aeolian harp delicacy formed a transparent but unbreakable net beneath Basie. Page, who had a generous tone on the bass and a bushy way of hitting his notes, gave the group much of its resonance, which was either echoed by Jones's foot pedal and snare or diluted by his cymbal work. But the group's steady tension also derived from the way its members counteracted each other's occasional lapses. When Page's sense of dynamics or harmony gave way to overly vibrant or bad notes, Basie might blot them up with his left hand or release a spray of upper-register exclamations. When Greene's perfection seemed tediously precise, Jones's accents or Basie's unpredictability offset it. 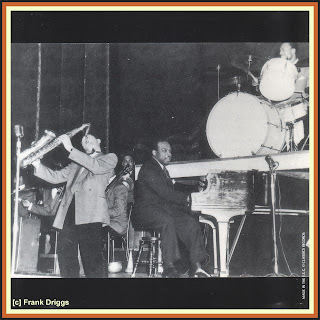 And when Jones occasionally grew heavy, slowed down, or raised the beat, Page, Basie, and Greene would head resolutely in the opposite direction. Most important, the Basic rhythm section dedicated itself to the proposition that each beat is equal, and, knee-actioned, wiped out both its own bumps and those handed down by all past rhythm sections. Although the group broke up more than a decade ago (only Greene remains with Basie), its low-key drive continues to seep into the four comers of jazz. And Jones, who has since worked with all types of jazz musicians, has been particularly pervasive. Jones's style, which has not changed appreciably in the past twenty-five years, except for some sporadic, and pardonable, middle-aged heaviness, is elegant and subtle. As an accompanist, he provides a cushion of air for his associates to ride on. Primarily, this is achieved by his high-hat technique. His oarlocks muffled, he avoids the deliberate chunt chunt-chunt effect of most drummers by never allowing the sound of his stick striking the cymbals to be audible, and instead of ceaselessly clapping his cymbals shut on the traditionally accented beats he frequently keeps them open for several beats, producing a shooshing, drifting-downstream quality. Jones's high-hat seems alternately to push a soloist along, to play tag with him, and-in the brief, sustained shooshes-to glide along beside him. His high-hat also varies a good deal according to tempo. At low speeds the cymbals sound like quiet water ebbing. At fast tempos they project an intensity that is the result of precision rather than the increase in volume displayed by most drummers. The rest of the time, Jones carries the beat on a couple of ride cymbals, on which - as opposed to the tinsmith's tink tink-tink of many drummers - he gets a clean, pushing ring. 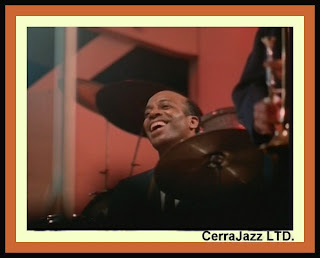 All of Jones's cymbal-playing is contained by spare and irregular accents on the bass drum and the snare, the latter of which he employs for rim shots that give the effect of being fired at the soloist's feet to keep him dancing. On top of all this, these devices form an unbroken flow; each number - pneumatically supported - comes through free of the cracks and breaks that drummers often inflict in the belief that they are providing support. Jones's brushes have been equaled by only a few drummers. They are neat, dry, and full of suggestive snare-drum accents, and when used on cymbals often seem an embellishment of silence rather than a full-blooded sound. Jones is the embodiment of his own playing. A handsome, partly bald man whose physique resembles a tightly packed cigar and who moves in a quick, restless way, he smiles continually when he is at work, in a radiant, everything-is-fine-at-home fashion. Although he sits very still behind his drums (remember the demonic posturing of Gene Krupa? ), his hands, attached to waving undersea arms, flicker about his set and his head snaps disdainfully from side to side, like a flamenco dancer's. His solos, which have recently increased in length and variety but without losing any of their structure, sometimes begin with the brushes, which tick and polish their way between his snare drum and his tom-toms in patterns frequently broken by punching pauses. (Jones's solo brushwork - stinging and nimble - suggests, in sound and figure, that ideal of all tap-dancing, which great tap-dancers always seem headed for but never quite reach.) After a while Jones may joggle his high-hat cymbals up and down with his foot, while switching to drumsticks, and launch into riffling, clicking beats on the rim of a tom-tom as well as on its head (he may muffle it with one hand, achieving the sound produced by kicking a full suitcase), interspersed with sudden free tom-tom booms. He will then drop his sticks, under cover of more high-hat joggling, and go at the tom-toms with his hands, hitting them with a finger-breaking crispness. More high-hat, and he will fall into half time and, sticks in hand again, tackle the snare drum, at which he is masterly, starting with a roll as smooth as hot fudge being poured over marble. Gradually loosening the roll with stuttering accents, he will introduce rim shots - a flow of rolling still intact beneath - spacing them with a breath-catching unevenness, and then, in a boomlay-boom fashion, begin mixing in tom-tom strokes until the tom-toms take over and, in turn, are broken by snippets of snare-drum beats. Jones will slowly subside after returning to the snare for a stream of rapid on-beat strokes, and - an eight-day clock running down - end with a quiet bass-drum thump. There have been no cymbal explosions, repetitions, or dizzying, narcissistic technical displays. One has the feeling, in fact, of having heard distilled rhythm. Three of Jones's recent efforts - "The Jo Jones Special" (Vanguard), "Jo Jones Trio" (Everest), and "Jo Jones Plus Two" (Vanguard) - are sufficient samplers of his work. The first record is valuable largely for two takes of "Shoe Shine Boy," in which the old Basie rhythm section is reassembled, along with Emmett Berry, Lucky Thompson, and Benny Green. (Nat Pierce is on piano in four of the five other numbers, and for the last there is an entirely different group, composed of - among others - Pete Johnson, Lawrence Brown, and Buddy Tate.) The two versions are done at medium-up tempos, and are just about equal in quality. Thompson and Berry are in commendable form, but the rhythm section is priceless. Listen, in the first take, to the way Jones switches from joyous high-hat work behind Basie's solo to plunging, out-in-the-open patterns on his ride cymbal when the first horn enters; to Basie's down-the-mountainside left hand near the end of Thompson's first chorus; and to Jones's four-bar break on his snare drum at the close of the number, done with sharply uneven dynamics that make the prominent beats split the air. There is also a rendition of "Caravan," by the alternate group, in which Jones takes a tidy solo, complete with mallets on the tom-toms, bands on the tom-toms (here, a plopping sound like that achieved by hooking a finger into one's mouth, closing the lips, and drawing the finger abruptly out), and oil-and-water patterns on the snare with sticks. 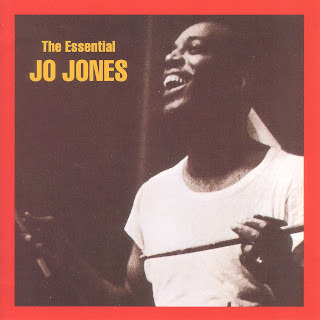 The recordings reviewed by Whitney involving the Bryant Brothers and Jo have all been released on CD entitled The Essential Jo Jones [Vanguard 101/2-2], a compilation that also contains six tracks from the Vanguard LP The Jo Jones Special that features many of Jo’s buddies from the Basie Band such as trumpeter Emmett Berry, trombonist Benny Green, and tenor saxophonist Lucky Thompson. 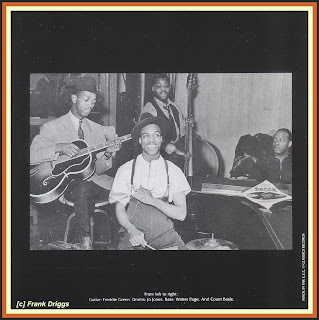 Freddie Green on guitar and Walter Page on bass, is old rhythm section mates, are on these cuts and Count Basie makes an appearance on Shoe Shine Boy. 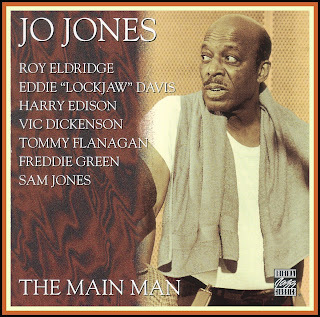 “Jo Jones is not only one of the great drummers of jazz but also a major original artist who has left a permanent mark on jazz history and development. The word "great" is one that this writer always feels a little embarrassed about using in connection with a jazz musician; not that the term isn't justified, but that it jars so painfully when one thinks at the same time of the insecure existence that is the lot of practically every such performer, including those long celebrated as "geniuses" in books and treatises. When a man is publicly recognized as "Great" it should earn him, one thinks, an opportunity to keep producing his best with an untroubled mind. But such a Utopia has not yet arrived. And still, it is one of the miracles that out of the blind and insane commercial musical world to which jazz is inextricably bound, a world that blows hot one year and cool the next, that hands out bonanzas and blanks according to the caprices of fashion, so much comes forth that is a continual testament to the power of the creative imagination. In this jazz world Jonathan 'Jo" Jones, born in Chicago, has worked for many years. He has been a star of undiminished brightness from the years (1936-1948) in which he sparked the incomparable rhythm section of the famous Count Basic band, through his subsequent performances with various combos, and demand appearances on radio, television and record sessions, to today. when he presents his hearers with a jazz of solid integrity, and effervescent flow of fresh ideas. 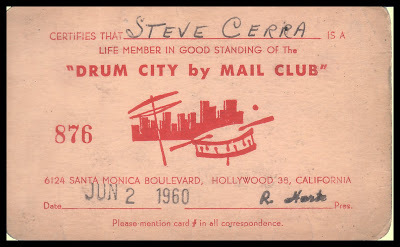 There are many outstanding drummers in jazz, and each has his devoted admirers. 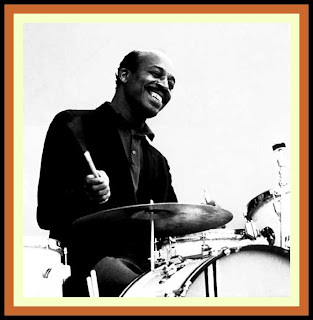 But all would agree that Jo Jones belongs among the elect, and there is no list of the drummers who have made jazz history that would not put him at the top or close to it. He combines an incredible technique with lightness, humor and imagination. He single-handedly changed the entire concept of jazz percussion. 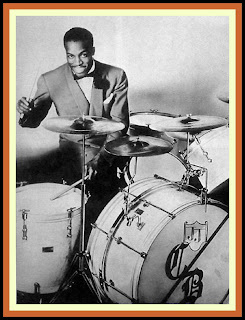 Great drummers like Chick Webb, Gene Krupa and even Sid Catlett had provided the rhythm section and the entire band with a driving power and beat. Jo relaxed the drive of the right foot, using it for just the necessary accents, reminding the listener of the beat rather than insisting on it, realizing that one note in the right place could have more effect that a flurry of sound. He added a variety of timbres, establishing the jazz battery of drums as a musical instrument of genuine beauty. It was the perfect counterfoil to the new approach to jazz piano introduced by Basie. Thankfully, Burt Korall has included a 46-page chapter on Jo in his Drummin’ Men: The Heartbeat of Jazz – The Swing Years [New York: Schirmer Books, 1990, pp. 117-163]. 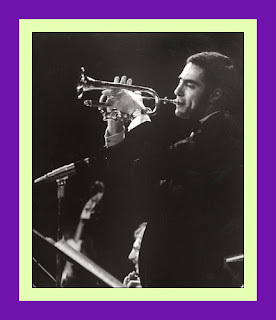 And while this is far too much information for the purpose of this profile, the editorial staff at JazzProfiles has used Burt’s chapter to put together the following brief synopsis of Jo’s career and some of the qualities of mind and manner that made him unique. “Jonathan David Samuel Jones was born October 7, 1911, in Chicago, the son of Samuel and Elizabeth Jones. Jo always wanted to learn, to be able to give more and more of himself. Because he was by nature a curious and highly sensitive person, with a capacity for absorbing what he saw and heard, Jones assimilated and integrated what he experienced musically. The process was never-ending; that's why Jones never got "old" as a player. He also used what he learned in his own way. He wasn't a copy. Growing up during the 1920s, Jo Jones was on intimate terms with the growth and development of multiple types of popular music and entertainment, He was there, taking it all in, participating: he traveled around the country in carnivals and vaudeville, medicine shows and circuses; later, with bands and groups, he added to the sum of his knowledge. Responsive to and respectful of those who really knew the field, he became an informed, increasingly colorful figure-sure of his ground, seemingly always putting others to the test. An artist who knew how to manipulate audiences, Jo Jones was a performer. How he dressed, how he carried himself-everything was part of the impression made, he said. He and his contemporaries were "show business" because that's the way it was when they were coming along. Though many things about Jones changed with the years, the way he "performed" in front of an audience remained unchanged. Like Count Basie, his great friend and longtime employer, Jones was completely and thoroughly stage-struck. He enjoyed being around musicians and performers, theaters, clubs, and concert halls, and loved anything that had to do with music and entertainment. He relished talking shop. More than most, he cared for and nurtured young players. Jones was deeply proud of being a musician and realized his responsibility to up and coming musicians. Despite protestations to the contrary, he never really thought seriously about being anything but a performer. His fascination with the business was permanent. His need to play and be a part of music never left him-even as life came to a close. “It was Jones' feeling that other musicians missed a lot by not having the benefit of widespread experience. At the close of his life, he often said that Roy Eldridge was one of the few remaining players who had "gone to the same school." Only Eldridge had shared with Jones the wonder of travel and the diversity of show business. The others "never saw the people ... they didn't hit the forty-eight states-villages and hamlets," he declared. "After World War II, it got so they could get an airplane and they never saw nothing!" As vaudeville, carnivals, circuses, and other traveling shows felt the effect of talking pictures, radio, and recordings, it became apparent to Jones that the future was elsewhere. 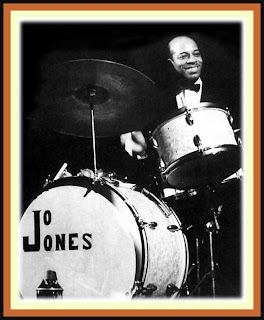 Because of the change in the entertainment business and the response of people to it, Jones became increasingly involved with drums and the performance of music with bands. From the late 1920s until linking up with Count Basie in Kansas City in 1934, Jones played his way through a number of bands. He traveled a good deal of the time, using Omaha as his center of operations, all the while becoming immersed in what was happening in music through the Midwest and Southwest. Jones set a pattern that he followed to the end of his life. Wherever there was a prospect of great music being made, he turned up. He found out, or instinctively knew, where the great sessions would be held in any city or town. He played piano, vibraphone and drums, depending on what was necessary and how he felt. He soon realized that he could be most expressive on the drum set. By the time he joined Basie, Jones had forsaken the other instruments for the most part. Besides, "being a drummer paid better." Jones didn't talk much about playing with the pre-Basie bands. But he indicated that performing with the Ted Adams Band, Harold Jones' Brown Skin Syncopaters, the Grant Moore Band, the Jap Allen Band, the famed Bennie Moten Ensemble, and Lloyd Hunter's Serenaders-with whom he made his first record in 1931-helped him develop his distinctive manner of playing. “The performers of the Midwest and Southwest were noted for their rhythmic invention and change. rhythmic invention and change. During the 1920s and the first years of the 1930s, there was a progressive modification of the pulse of Midwestern and Southwestern bands. One has only to listen to the early Bennie Moten recordings on Victor--cut in the 1920s-and the 1932 session for the same label by this premier Kansas City band. The time feeling moves from two beats to the measure to straight four. Other influential bands within this general territory, such as the much-admired ensemble led by Alfonso Trent, and certainly Walter Page's Blue Devils, were going in the same direction as Moten. They were starting to relax and swing. [Quoting drummer Cliff Leeman]: Jo was sitting up there above the band, smiling and cooking. The band was on fire. Basie had found the recipe and Jo was a key part of it. Let me tell you, the band became unbelievable. You never felt anything like that! Jo scared the life out of me. I had never heard anyone play that way in my entire life. 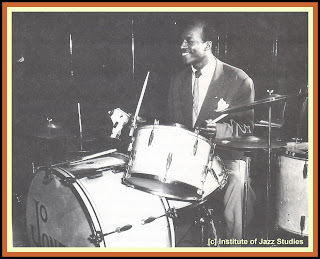 Jo Jones had a great influence on every drummer who heard him, particularly in those early years. He played the high-hat with so much finesse. He did so much on it that he turned it into an independent instrument. So many techniques and touches for the hat are his creations. Jo was the first person I ever heard keep time on a closed high-hat while developing counterpoint-in-rhythm with his left hand on the high-hat stand. So many things: the feeling of variation he brought to high-hat playing-how he changed the accents and the feel of the dotted eighth and sixteenth rhythm without interrupting the flow. His little kick beats on the bass drum behind Basie's piano-so unusual for the time. The way he tuned his drums, to intervals, also was a plus. His drums had an open, un-muffled sound. This sort of tuning is difficult for many drummers because it demands great control of the hands and the right foot. The tuning worked well for him; he found he could get out what he wanted to say because the situation was so challenging. One of Jo's most charming bits of business was a thing he did with his right heel. He kept time with it on the floor, combining this sound with what he did on the high-hat. Frequently he would take his foot off the bass drum pedal and use the clicking of the right heel on the floor, alone, as an extra bit of color. While playing brushes, he'd sweep with the left hand and play a shuffle beat with the right. it was a particularly powerful technique when the tempo was up there-real fast. The beat became so strong. It wasn't the kind of shuffle beat you associate with bands like Jan Savitt; it had the feeling of a triplet while retaining something of the shuffle. It made you think of a tap dancer. So many great drummers have been tap dancers and come from that tradition: Jo, Big Sidney [Catlett], Buddy [Rich], Louie Bellson. It's hard to believe that Jo did all that great stuff on drums [that were] held together with ropes and on cymbals that were just awful. Until Jo became more widely known, and replaced them, he had a rag-tag bunch of drums and cymbals. Still he made them sound. 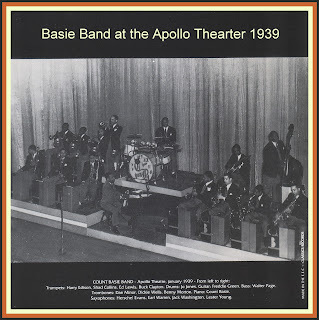 “’The All-American Rhythm Section’ of Basie, Page, Green, and Jones had its own recipe. Relaxing, being natural, responding consonantly and with feeling to the music-all of this gave the section distinction. The section blended flow and interaction, flexibility and freedom, bringing to the Basie music a lightness and a provoking sense of pulsation that carried one along. 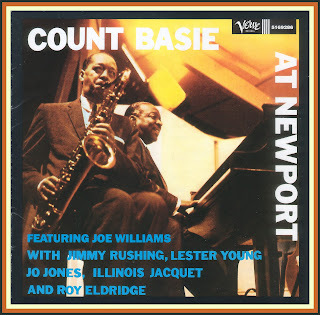 “The years with Count Basie formed the core of his musical life. Subconsciously, he compared everything before and after with the Basie experience. In many ways, Jones never left the band. Until the end of his life, there was that link with Basie. 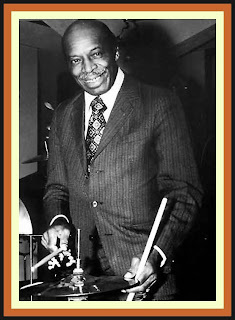 In the mind of the public and many of his colleagues, Jones remained Basie's drummer, despite the fact he played so well with others and on his own. In spirit, Jo and Basie were together until the pianist's death in 1984. The love and respect Jones had for his old friend and former employer often were quite touching. As Basie wound down his life, encumbered by illness, Jo kept at him to slow down, in his typically gruff manner: "All the man has to do is maybe ten concerts a year. 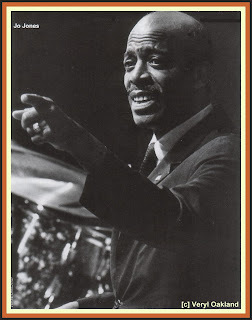 He could get Pep [Freddie Green], a bass player, and me and not work so hard," the drummer insisted. "But he has to have that band and travel all the time. No need for that at this point!" Every time he discussed Basie's schedule, Jo revealed his concern for what might happen to his buddy, his deep voice sharpening into an exclamation point. Less than a year later, on September 3, 1985, Jo was gone, too. IRV KLUGER: “Jo created colors, laid down the down beats and up beats, and brought the [Basie] band in. A revolutionary change had taken place. The Basie feeling was so different from the 4/4 thumping of other sections. Jo’s cymbals, the guitar and the bass walking together, the plinking of Basie and the way he edged in his left hand once in a while – it just lightened everything up and made the jazz rhythm section come to the fore. What these guys did was very difficult to imitate. You had to be so fine. You had to know why you were there. 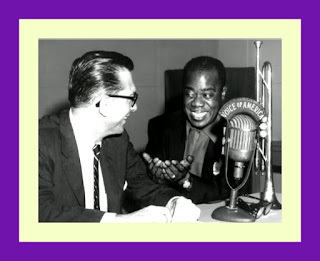 EARL WARREN [lead alto player with Count Basie 1937-45]: “During the heyday of the Basie Band, it was essential – certainly when you played theaters – for the drummer to play an extended, interesting solo – not a lot of noise. Jo came up with some of the sharpest drum solos I ever heard. His vehicle was ‘Prelude in C Sharp Minor,’ a Rachmaninov thing. Jimmy Mundy made an arrangement together for him. Jo put together a composition each time he played that feature. What he did was tasteful and very rarely did he go over the same ground twice. His solos could begin on any part of the set. He moved all around. I particularly liked what he did on the tom-toms. MEL LEWIS [drummer, co-leader of the Thad Jones Mel Lewis Orchestra later to become the Mel Lewis Jazz Orchestra, both forerunners of the current Village Vanguard Jazz Orchestra]: “Of course, Jo played the high-hat for Pres. But he did something else for him … and only for him. He did what he called his ‘ding, ding-a-ding’ on a small, heavy cymbal sitting on a spring holder that was mounted very low on the right side of the bass drum. It had a sound that carried and surrounded Pres. ROY ELDRIDGE [one of the most influential trumpet players in the history of Jazz who was featured with a number of Swing Era Big Bands]: “You know one thing that people overlook about Jo’s playing in the Basie Band? His bass drum. He didn’t stop playing it, as some say. He kept a light four going, giving a bottom to the rhythm. Drummers in those days used to tune their drums to a G of the bass fiddle. And the way they used their bass drum didn’t come out boom, boom, boom, but just blended with the bass. The guitar was also playing four, right? So everything was going along the same course, together! JAY McSHANN [long-time, Kansas City resident band leader who gave Charlie Parker’s career an earlier start]: “Jo Jones had that thing, that swing that everybody dug so much. All the drummers ‘round town learned from him. Jo could play with sticks and then brush you into bad health. Like the other drummers out there who could really play, Jo was relaxed and not too technical. 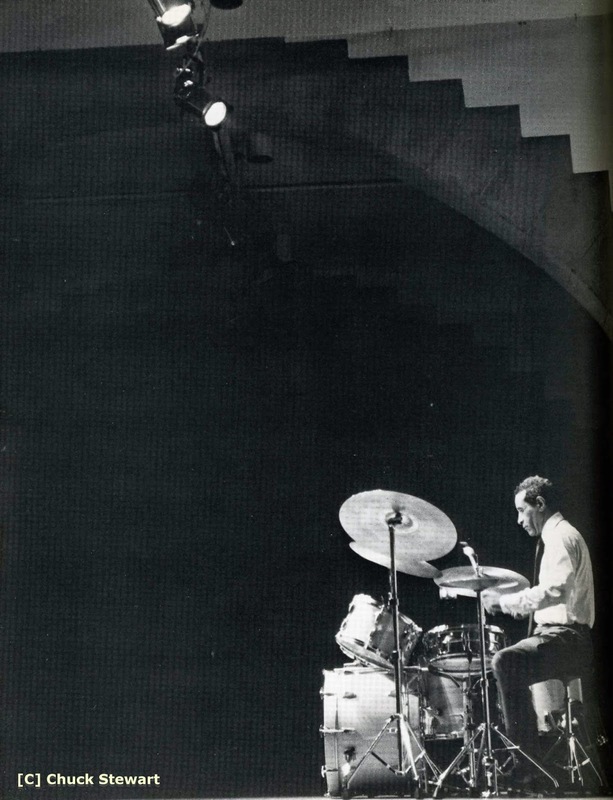 LOUIE BELLSON: “I remember one of the last jazz festivals in Newport, George Wein decided to get all the drummers he thought were top echelon at the time. 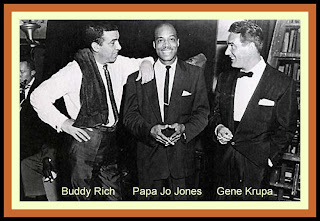 Buddy [Rich] was there Mel Lewis, Elvin Jones, Roy Haynes, maybe two or three other players [including Louie]. Buddy did his thing, pulling out all the stops. I did everything I could with two bass drums. Elvin played real well. Everybody just – boom! – played hard and creatively. In 1976, not the best decade for Jazz on records, Norman Granz brought Jo and a bunch of old [and some new] friends together at the RCA Studios in New York and, as a fitting tribute to Jo, recorded Jo Jones: The Main Man [Pablo 2310-799; OJCCD-869-2]. On it Jo is joined by former Basie-ites Harry “Sweets” Edison, Vic Dickenson, Eddie “Lockjaw” Davis, and Freddie Green. Roy Eldridge partners with “Sweets” to form a brass section and Tommy Flanagan and Sam Jones pair up with Green and Jones in the rhythm section. In August, 2008 the Veterans Committee elected Jo Jones to the Downbeat Magazine Jazz Hall of Fame. And while we are grateful to them for doing so, it would seem that their timing is not nearly as good as Jo’s.